For or perhaps from the records. I'd delighted to announce that I am joining such august company as Chris Mooney, Tim Lambert, and many more in being assimilated by the Borg, aka Scienceblogs. It looks like I'm now online at http://scienceblogs.com/stoat/; there are still a few minor setup issues (I hope "who is that in the picture"? won't be an issue by the time you go over and check). Fear not! My editoiral independence is unchanged, and I still get to be called Stoat. Scientists are people too. The money and perks available to IPCC people are extensive. If oil company scientists are unenthusiastic about GW, then it can be argued that IPCC scientists might be enthusiastic from the same kind of incentives. But... how much does climate research cost? Apparently someone said at AAAS this year that globally, roughly $2 billion is spent on climate research, half of that is in the US, and a quarter each in the EU and the rest of world. And I've heard similar numbers elsewhere. I'm going to accept it, because it fits rather nicely with another number I've just found, from the Economist, wot sez: Monitoring local government currently costs £2.5 billion a year, and that does not include the cost to councils of being inspected (this is in the context of the emasculation of local govt in the UK: since they cannot raise much in taxes, but are paid from central taxation, the central govt insists on minutely monitoring what goes on). So... assuming that figure is accurate: the costs of simply *monitoring* local govt (not actually doing anything) in one small country exceeds the global climate spend. Do we look forward to skeptics now pronouncing that local govt inspectors are only in it for the money? However... there is more. The $2 billion annual spend is not all on salaries. Whenever this gets discussed, people usually say that this includes a large chunk spent on satellites, which are expensive. I presume that the costs of the newly approved Cryosat II will get included in the annual climate spend. Its a bit like including the costs of CERN hardware when working out whether particle physics is lucrative or not. Part of the reason for this post is to invite anyone with better figures to post them. What does Dr Google say? Bush's proposed budget for ... 2004 ... U.S. spending on climate change this year to $4.3 billion.... Ah yes, but that includes "Tax Incentives for Renewable Energy and Hybrid and Fuel-Cell Vehicles...", about $1b/y. Further down, "Federal Climate Change Science Program (CCSP): Includes $1.7 billion in FY '04 budget request to fund Federal, multi-agency research program, with $185 million requested for the Climate Change Research Initiative in FY '04." And this accuses Bush of cooking the books, anyway. Although the United States spends $1.8 billion a year on climate research, only 6 percent goes to modeling... England, on the other hand, has focused its spending, with $50 million for the European Center for Medium Range Weather Forecasting and another $25 million for Hadley Centre for Climate Prediction and Research. Um. So, anyone got any bettter numbers? The BBC seems to be promoting the Climateprediction.net stuff: go to http://bbc.cpdn.org/. Good for cpdn I guess. "Melting Greenland fuels sea level rise says" Greenpeace. "A new report sheds light on Greenland's quickening meltdown — and why that's distressing" says Time. "Greenland's Glaciers Moving Faster, Losing Mass" says Kansas City Infozine. You get the idea (all of that via google news). Though the best one seems to be "Greenland ice melting faster than thought" by physorg.com. So what can they mean? Can it be "Recent Ice-Sheet Growth in the Interior of Greenland" in Science? Oops no, wrong sign, and anyway that was sooooo 2005 :-) Although to be fair even that mentions thinning below 1,500m. Using satellite radar interferometry observations of Greenland, we detected widespread glacier acceleration below 66° north between 1996 and 2000, which rapidly expanded to 70° north in 2005. Accelerated ice discharge in the west and particularly in the east doubled the ice sheet mass deficit in the last decade from 90 to 220 cubic kilometers per year. As more glaciers accelerate farther north, the contribution of Greenland to sea-level rise will continue to increase. Which is similar to "Rapid and synchronous ice-dynamic changes in East Greenland" by Adrian Luckman et al in the less visible GRL, though New Scientist found it, as did the BBC. 90 to 220 km^3/y is an increase of about 0.4 mm/y in global sea level according to a quick calc (and I'm sure the arithmetic fiends will be quick to jump on me if I'm wrong...). This is 20% of the current 2 mm/y obs (or 13% of the 3 mm/y obs, if you take the more recent satellite obs). Or if you think it *caused* the increase from 2 to 3, its about half of that... The TAR estimates put Greenland into context (as they were then; oh, and here). RP Sr has a weird post about "consensus". He has written a paper with four colleagues, and oddly enough they agree. Which is what usually happens when people write papers together. If they don't agree, they tend to write papers separately. And yet apparently this is to be a new model for the whole community: This paper shows not only can we document a weather event using a variety of climate metrics, but colleagues can work in good faith to produce a truly consensus assessment. This is the model that the global climate change community should adopt. Wooo-eee! yes, lets get 5 people to write the next IPCC report, then there would be no problem with getting agreement. Well, obviously enough detecting hurricanes isn't too hard. But the question exercising many people minds is *attribution*: has GW lead to an increase in hurricanes? Attributing individual hurricanes is difficult/impossible (the line taken by RC); we're talking about over all trends & stats. JA (when not blogging about pet food) has a nice article about attribution here, though he means attribution in general. And there is a nice article about an interview with Judith Curry (top quote: William Gray is one of some "hurricane scientists who don’t know a lot about global climate"). But the point I wanted to make is that failure to attribute to GW does *not* amount to an attribution to anything else: natural cycles, etc etc. And failing to determine a human signal is not the same thing as ruling out a human signal (BTW, I'm not actually asserting that this "failure" has occurred). Which brings me to RPs beastly rough post Slouching Toward Scientific McCarthyism (also read the comments). He quotes "NOAA attributes this increased activity to natural occurring cycles in tropical climate patterns near the equator" (my emphasis). 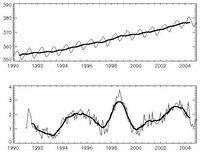 RP believes that disagreeing with "The increased activity since 1995 is due to natural fluctuations and cycles of hurricane activity" (again, my emphasis) is bizarre, since the statement is "fully supportable by peer-reviewed science". But is it? For it to have been so, there would have to be a proper attribution to natural causes. If there is any such papers, what are they? As for the Genesis Strategy predicting cooling, this is obviously wrong, if you actually read the book: www.wmconnolley.org.uk/sci/iceage/schneider-genesis.html. "Crazy" LH said: R+S said: "It is found that, although the addition of carbon dioxide in the atmosphere does increase the surface temperature, the rate of temperature increase diminishes with increasing carbon dioxide in the atmosphere." So Ender, Phil, and whoever, this clearly shows that as CO2 keeps increasing, the surface temperature actually starts decellerating. Do any of you actually read and think about what you have read? Then increased CO2 causes cooling. LH is wrong (well of course he is, he's wrong about everything!). Increasing CO2 increases T roughly logarithmically. This is well known, and its what S is saying. But adding CO2 always causes warming in those models. Was the MWP global? Castles doesn't seem to have read the TAR: the relevant bit is http://www.grida.no/climate/ipcc_tar/wg1/070.htm, to quote "As with the “Little Ice Age”, the posited “Medieval Warm Period” appears to have been less distinct, more moderate in amplitude, and somewhat different in timing at the hemispheric scale than is typically inferred for the conventionally-defined European epoch. The Northern Hemisphere mean temperature estimates of Jones et al. (1998), Mann et al. (1999), and Crowley and Lowery (2000) show temperatures from the 11th to 14th centuries to be about 0.2°C warmer than those from the 15th to 19th centuries, but rather below mid-20th century temperatures. The long-term hemispheric trend is best described as a modest and irregular cooling from AD 1000 to around 1850 to 1900, followed by an abrupt 20th century warming..." and so on. M.K. Hughes and H.F. Diaz, "Was there a 'Medieval Warm Period? ", Climatic Change 26: 109-142, March 1994 is worth a read. If you're interested in how the MWP/LIA were viewed in the various IPCC reports, then [[MWP and LIA in IPCC reports]] is your source. Castles quotes "Finally, on the realclimate site William Connelley [sic] says that it's about time that Castles and Henderson got off their bums and produced their own scenarios!". Yes indeed. In fact even people like Tol admit that using your assumptions makes essentially no difference to the end product. The stuff about some US politico's editing their wiki bio's was on the news recently. Wiki's view of that is here; and amusingly, people have filed an RFC against them. Really, who could possibly so tasteless as to edit their own wikipedia entry ;-)? Ironically, just as global warming scare-mongering reaches new heights, the global cooling hypothesis is making a come back. It should be recalled that the frightening images of imminent global warming disaster are of fairly recent vintage. After all, in the 1960s and 1970s various prominent climatologists held the view that it was not global warming that formed a mortal threat to humanity but global cooling. This is traditional septic tripe, there is probably a plug-in for Word to auto-generate it. The traditional answer is http://www.wmconnolley.org.uk/sci/iceage/. More recently, a novel answer of http://www.realclimate.org/index.php?p=94 has become available. Why is he writing it? Probably because he has just written Man-Made Global Warming: Unravelling a Dogma. Published by... Multi-Science Publishing Co., Ltd, UK. And where have we heard of them before? Aha, yes: E&E. Sigh. As for the rest of it, there's nothing much worth noting, except that he asserts that "various renowned scientists have distanced themselves from the IPCC", and puts Hans Oerlemans in this category. This is odd; Hans was a lead author for FAR, SAR, TAR and even that bogey-man of the septics, ACIA (see his page). And given his recent Science paper the assertion seems even more odd. Probably septic desperation. I'm reading Kuhn, "The structure of scientific revolutions". I'm only up to chapter 7 so far, and not desperately impressed. Perhaps it gets better later. Anyway, by curious co-incidence, a piece of it is relevant to the "methane debate", recently energised by Keppler et al. (btw, don't miss the clarification). We had a "discussion group" about this at work: mostly ice core folks whose ultimate interest was interpreting delta-C-13 in ice cores; but most of the discussion was trying to make sense of the paper. And the thing that came up repeatedly is that the *mechanism* for the methane production is unknown. Given that, its really not clear what to measure. At some point, the mechanism will be understood, or at least there will be a testable hypothesis, and suddenly there will be a mini-paradigm-shift (K states that P-shifts are not always major revolutions; they are allowed to be little things in their own area). To illustrate this: the paper measures methane production from both dead and living leaves. The dead stuff produces much less methane (order of magnitude). Is this because the methane in this case is the breakdown product of some molecule produced by the living plant? In which case a time series would be instructive. But the paper doesn't present this. Then again: for living plants, the paper asserts that production is bigger in sunlight. The measurements weren't terribly well controlled, as the paper notes make clear: "sunshine" is defined as what you get in Heidelburg. And then the problem is: if you expose the plant to sunlight, it will get warmer. And elsewhere they note the strong temperature sensitivity of their results. So all of this is rather typical of the early stages: something odd is found, but the measurements are all in a bit of a fog and its not clear exactly what you are trying to measure. A bit more commentary on the results: all this turns out to come from about 10 living plants, extrapolated to the planet. So the error bars are huge. It may turn out that these plants are quite atypical. Or, they may turn out to be quite typical. In which case, the methane budget is overthrown? Well, probably not that either. The sinks in the methane budget seems to be well known (mostly atmos oxidation); the sources (wetlands, rice paddies, gas leaks) have pretty big error bars. Most of the overall budgets people construct from these various sources add up to about the same number, but that is because people know the number they are supposed to get: viz, the number that makes the current observed increase work out about right. So (especially if the new results come in at the low end of their range) they can be fitted into the existing methane budget quite easily. Sounds like a US TV show, no? In more detail Stern Review on the economics of climate change. Sponsored by the treasury, but nominally an independent review. What relation is it to the failed House of Skeptics Lords report? The HoS reported in early July 2005; co-incidentally the "Chancellor announced on 19 July 2005 that he had asked Sir Nick Stern to lead a major review of the economics of climate change, to understand more comprehensively the nature of the economic challenges and how they can be met, in the UK and globally." I don't know. Best guess is convergent evolution: the problems that need to be addressed are obvious. But it may be a response/corrective. The Stern review isn't finished; we have a Discussion Paper from 31 January 2006 (together with a pile of similar-looking stuff related to a lecture/press: see the index). Climate change is a serious and urgent issue... There is now an overwhelming body of scientific evidence that human activity is increasing the concentrations of greenhouse gases in the atmosphere, and causing warming. We are already seeing significant impacts. There remain uncertainties about the nature and scale of impacts in the longer term, but the most recent science indicates that some of the risks are more serious than had first appeared. The problem is global in its cause and consequences. Greenhouse gases have broadly the same impact on the climate wherever in the world they are emitted. And in terms of its consequences, no region will be left untouched. But impacts will be unevenly felt throughout the world. Some of the most severe impacts will be felt in the poorest countries that are least able to adapt to the changes. The economic challenges are complex. At its most basic level, climate change is an externality: the emission of greenhouse gases damages others. But these costs will be felt over a long period and over the entire globe; their exact nature is uncertain; they interact with other market failures and imperfections; and those most affected – future generations – are not able to speak up for their interests. This points to a long-term international collaborative response. Effective collaboration will require a shared understanding of the incentives and institutions needed, and careful attention to the complex ethical issues involved. Actually that seques from the science to the economics, but I'm happy with it so far (RP will quibble the some of the risks are more serious than had first appeared and perhaps I will too... oh hold on, they give examples later: for example release of greenhouse gases from thawing permafrost or the dieback of the Amazon forest. Yes thats fair enough). After that we're on econ/pol, which I'll ignore. The fun thing, though, is that Stern has put all the evidence submitted online, which makes for some fun reading. Boehmer-Christiansen seems to have failed to do even a basic punctuation and spelling check before she submitted. However, her evidence itself is deeply boring and carefully avoids the science. British Airways also wimps out of the science - perhaps they (correctly) regard it as a foregone conclusion - and spend a lot of words saying "please don't tax aviation fuel" in a coded way. To my surprise the CBI don't quibble the science: In view of the scientific consensus about the level to which concentrations of carbon need to be reduced, we think it right that the government’s ambition should be for the world’s developed economies to cut greenhouse gas emissions by around 60% by around 2050 – and that the UK should put itself on a path towards achieving such reductions. Well well. Someone called Pielke, P :-) has also submitted, and has said what you would expect. While we're on the miss-spellings, "Exxon Mobile" (the fly-by-night branch?) couldn't be bothered to write a proper submission so they dump a pile of old reports on poor Stern, all of which (you guessed it) carefully avoid any mention of the science, which appears to be their current strategy (a step up from trying to poke holes in it, as they used to). Rahmstorf argues for Sea level rise as a defining feature of dangerous interference with the climate system which harks back to what-is-dangerous: In the UNFCCC, most nations of the world have agreed to stabilise greenhouse gas concentrations in the atmosphere at a level that will prevent “dangerous interference with the climate system” (Article 2). A key question for policy thus is: what level can this be? We here propose a criterion involving long-term sea level rise. We argue that a significant likelihood of causing a global sea level rise in the range of 3-5 m over the next few centuries (say, by the year 2300) would constitute a “dangerous interference”, since such a sea level rise would destroy much of the current world coastlines, including small island states, many large cities, most beaches and many coastal ecosystems. But enough serious stuff, I was wanting to look through the skeptics, sadly they don't label them so you have to look through for keywords like Kininmouth. Who mentions that well-known piece of science, The Day After Tomorrow. Its always convenient when people start off with stuff like that, so you know not to bother taking them seriously (if you think I'm being impolite, he has the gall to call t' hockey stick "fraudulent", so is beyond the Pale). Oooh, but thats not the best bit: apparently "There are ongoing efforts by the climatology establishment to suppress any meaningful debate on the science of greenhouse gases". And his evidence? "The first serious problem with the theory of anthropogenic global warming is that tropospheric temperatures, which have been measured by satellites since 1979, show no significant upward trend". But this is botty-wipes, as [[Satellite temperature measurements]] will show you. Come on: if you're going to be a septic, at least don't be a cr*p one. The Marshall Insititute has a submission, but its so dull and stupid I won't bother link to it. "Allan MacRae" (who he) rants on: The current scientific basis of the Kyoto Protocol is deeply flawed - its greatest weaknesses include excessive reliance on: 1) The IPCC 2001 Summary for Policymakers (SPM) report, which is now in disrepute... etc etc. He seems to be connected to Baliunas, somehow. So... nothing too surprising. Science 1, septics 0; prize for most interesting piece of science evidence goes to Rahmstorf. I seem to be a bit too busy for science blogging at the moment. Firstly there is stuff at work, secondly I seem to be busy being an admin on wiki. Ah the sweet taste of power! The "Hansen gagging" story has been around a bit... now I find (via Roger on sci.env) this: I am writing in response to several recent news articles indicating that officials at NASA may be trying to "silence" Dr. James Hansen, the director of the Goddard Institute for Space Studies. It ought to go without saying that government scientists must be free to describe their scientific conclusions and the implications of those conclusions to their fellow scientists, policymakers and the general public. Any effort to censor federal scientists biases public discussions of scientific issues, increases distrust of the government and makes it difficult for the government to attract the best scientists. And when it comes to an issue like climate change, a subject of ongoing public debate with immense ramifications, the government ought to be bending over backward to make sure that its scientists are able to discuss their work and what it means. And so on. "Rising concentrations of greenhouse gases may have more serious impacts than previously believed, a major new scientific report has said"
Umm... whats happened? (I wondered to myself, lying fuzzy in bed at 8 a.m. listening to this stuff on the R4). Did they publish the AR4 a year early with major revisions to the conclusions? No. All this is about (source: BBC) the conference report from the Exeter conference in Feb '05. So (a) its not news; anything in the report (should!) have been said a year ago; and (b) I don't recall the Exeter conf saying much new at the time, either (backed up by the RC post I wrote at the time). And is this a "major report"? Probably not. The Beeb (check out the video...) picks up on the sea level rise from Greenland: It fears the Greenland ice sheet is likely to melt, leading sea levels to rise by seven metres over 1,000 years. OK, this is fair enough (depending on your scenario it might be more or less than 1000 years, and it might not all be gone for quite a bit thereafter, but its fair enough to be going with... say 5m in 1000 years). But again, its not news, its pretty well in line with the TAR (isn't it? I can't say I've bothered to check). 5m in 1000y is 5mm/yr which is more than the 2-3 mm/yr we have at the moment (and is effectively additional to it) and presumably wouldn't be linear but would come in spurts. Current (and TAR-like) projections for Greenland for the 21st century are much smaller - about 40 mm - which is about right: increasing T increases ppn, but also ablation, so past some (TA-DA!) 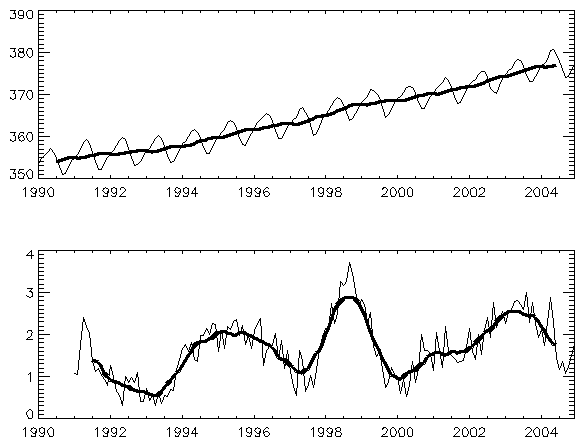 "tipping point" the SLR contribution from Greenland goes up a lot. But... that pushes the problem a way into the future. Is it reasonable for us to "commit" our descendants to a melting Greenland? (assuming the std.science is correct, and no magic is found, this is what we would be doing). What else? Above two degrees the risks increase very substantially, involving potentially large numbers of extinctions or even ecosystem collapses. This is onto the bio stuff: could be plausible, I can't comment usefully (I could make it up if you like...). This is linked to the 2oC target the EC has; see my RC post. So, supposing you didn't want to break +2oC (with probability X) you need to limit CO2 to Y; X=60% apparently translates into Y=450 ppmv; since we're currently at 380 my guess is we'll go through 450. And then it got onto Slashdot which (finally) prompted me to get a slashdot ID and post a comment. See if you can find it. I don't think I'll pursue commenting there... there is just so many comments, so much junk (though some good). This one I quite liked, though others didn't. Before the post, a quick joke, brought on by the word "Gazillion": Bush in the White House; an Aide says "Mr Prez, I'm afraid that 3 Brazillian soldiers were killed in Baghdad today". Bush is shocked, to an unlikely degree, and the surrounding Toadies are surprised. Bush asks: "Just how big is a Brazzillion, anyway?" (here is one source). And if you didn't like that, you can try The Onion. But onto more serious matters. Nature has a report about some new ice cores from Antarctica (thanks het, who has more links), and something of a race for the first "million year old ice". Kohnen Station in Antarctica's Dronning Maud Land has a new core, and Preliminary tests show that the bottom of the core might be as much as 900,000 years old. They sensibly hedge their bets with The age will have to be confirmed in their laboratory back in Germany, "but we're pretty confident,". But no sooner is this in, than Japanese scientists working at the Fuji Dome Antarctic research station said they have retrieved an ice core sample that could be up to one million years old (again, hedged). If you're wondering where all these various cores are, then look at the pic; original here. But the important thing about ice is not how old it is (if you want super-old ice, go mine a comet; mind you that might be quite expensive too...) its how well preserved it is and its stratigraphic sequencing. There are, if you look closely at the Nature report, hints of this: The Kohnen core should also provide more detailed climate evidence than the one from Dome C, at least for more recent times. 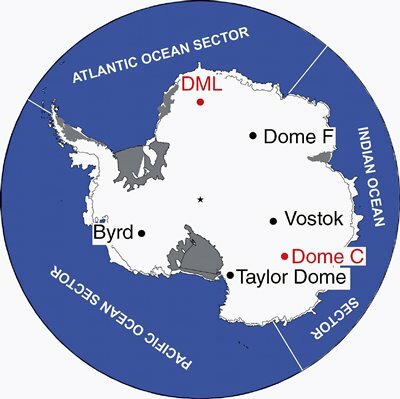 In the upper parts of the core, ice accumulated more than twice as fast as at Dome C, so it will be easier to distinguish between ice layers laid down in consecutive years. The ice at the bottom of the core, however, seems to be at least as old as that at the bottom of Dome C, so it must be very compressed. Err yes. So we'll get a more detailed *recent* record (which may have some value, e.g. looking again at D-O events in the Antarctic) but that could have been got from a much shallower core. And we'll get a record from a different sector (nice to see how things co-vary). But... a more detailed recent record implies a less detailed deep record; which is probably the greatest interest. The EPICA core goes down reliably to 780 kyr; does the Kohnen core provide useful info for [780,900] kyr? It will be good if it does. OTOH, since Kohnen isn't at a dome, the bottom is probably smeared, and very hard to work out where it came from. And a postscript, on how rapidly things get sensationalised: Researchers dig up million-year-old ice (bad headline, text not so bad). Ditto from physorg. It is a mistake to torture people. However, torture was regarded as a perfectly justified, legitimate way of producing evidence and it was therefore legally justified. Killing people over ideas, generally speaking, seems to us not to be a very good idea after 2,000 years of history ... and generally we disapprove deeply of this kind of purgation, but it seems to me it is possible to understand it within the context of its times and also to understand it within the sociology of religion, how communities react to threats which they regard to be dire or fatal. There are things to quibble here. Describing killing people as not to be a very good idea is a bit weak; and the "is" of the first sentence seems to delicately assert that it might not have been a mistake in the past. But the arguement that it can all be understood "within the sociology of religion" makes sense to me. But then, I'm an atheist, not a member of a church that claims to be the One True Faith, and on occaision, claims inerrancy. So is this the new Catholic policy? No Eternal Verities, just religion understood from within sociology and context. Sounds radical. Moving right along, we come to... Terrorism. Which brings me to Israel's shooting of young girl highlights international hypocrisy, say Palestinians (also from the G). And of course links to the recent Hamas victory (for which I'll refer you to CIP and subsequent). And the demands for Hamas to eschew Violence. Which is total nonsense: *we* don't eschew Violence, and nor do the Israelis (what do you think all those guns, tanks and warplanes are for?). Oh... you didn't mean *Violence* from the dictionary definition... you mean Violence excluding anything we do? And as for the equally slippery Terrorism: The army said the boys planned to throw rocks at Israeli cars, which the military defines as terrorism ah yes, Terrorism is what we define it to be. But shooting dead 9 year old girls definitely *isn't* terrorism ...as long as the right side is doing it, of course. Not the bristlecone pines again! Yes indeed. See this take on science publishing (via Island of Doubt). "My policy with regard to conclusions is to make the maximum plausible claim. It is foolish to leave any unncessary foothold for competitors...". Not only is this close-to-the-knuckle funny, its far more scientifically literate than anything you could hope to find in any UK newspaper. Over at http://www.eas.gatech.edu/research/candr.htm there is some fun, with Webster/Holland/Curry/Chang disagreeing rather strongly with Gray (also findable via this) over... yes you guessed it, hurricanes and trends. Its all a bit more raw and bloody than usual science correspondence (In spite of his concerns about data between 1970 and 1984 in the WHCC analysis, Gray nevertheless uses data from 1950 to bolster his arguments. Gray presents an alternative hypothesis for variations of hurricane characteristics in the North Atlantic that involves salinity variations; this hypothesis is not substantiated either in his paper or in the published literature. His analysis of the impact of warmer sea surface temperature on the stability of the lower troposphere contains basic errors in thermodynamics. In summary, there is no credence to any of the issues that Gray raises), so worth a quick read. JA's quote from Myanna Lahsen I think also applies. The graph shows recent CO2 changes. Top are the CO2 themselves (monthly, plus 13-month running mean); bottom are change-on-12-months earlier. Data from Mauna Loa; sadly I can only find them up to end 2004. Which means I can't provide a decent answer to SB, who asked about reports that this years CO2 rise was 2.2 ppmv. However, even if it was 2.2 (can anyone find a report, or better still the data? ), that looks to be nothing surprising, in view of the past. And its clearly lower than the 1%/y assumed by some of the idealised scenarios. When I find the SRES data I want to look at how the various scenarios look around now. I find it hard to get too excited about the exact levels for any one year; what matters are the long term trends; for the future, those are clearly Upwards, but by how much depends on economics that are rather tricky to forecast. But T rise (etc) can largely be scaled to CO2 level, rather than date. James Annan (ref lost) pointed out that methane levels seem to be well below SRES trends (indeed this shows them to be currently flat; whether that will continue I don't know). Meanwhile, JF has a post sort-of about this too, with a vigorous exchange of comments. This paper presents theoretical and modeling evidence suggesting that the atmospheric poleward heat transport can lead to a polar warming amplification (i) by redistributing part of the extra energy intercepted by the low-latitude atmosphere to high latitudes, and (ii) by strengthening the water vapor feedback in high latitudes. For an anthropogenic radiative forcing of 4 Wm/2, we illustrate that the dynamical amplifier contributes to about 1/4 (1/10) of the total high-latitude (global) surface warming in winter in a simple coupled atmosphere-surface moist radiativetransportive climate model. Budget analysis of the radiation fluxes at the top of the atmosphere derived from IPCC AR4 CGCM climate simulations seems to support the dynamical amplifier theory for the larger warming in high latitudes. The most interesting part of this is part (ii) - the strengthening of the WV feedback in high latitudes. Its interesting because although many people think its why polar amp occurs, this is the first paper I've seen to assert it. The least interesting is part (i), because thats been done already (and better, from a brief scan) by Alexeev in Cli Dyn (see my prev post). The problem is that Cai is using a 4-box coupled atmosphere-surface moist radiative-transportive climate model to illustrate the dynamical amplification of the high-latitude surface warming due to an anthropogenic forcing. And the WV feedback isn't done properly, The water vapor feedback has been crudely parameterized using an ad-hoc formula Equation 5 to mimic the strong dependency of the atmospheric absorption of longwave radiation to the amount of water vapor. Specifically, the total atmospheric effective emissivity in the model is made of two parts: a constant part e0 representing the absorption due to other gases, such as CO2, and a part that varies as a function of the total amount of water vapor in an atmosphere column. And worse than that, I can't see where they seperate out effects (i) and (ii), so at the end of it all I can't see where they say how important the WV feedback is (if we trusted their eq 5). James Annan has another classic post up, displaying his characteristic incisive wit and complete lack of sentimentality. According to the 10 o'clock news, its now dead anyway. As far as I can tell, this always happens: great public interest, pointless but newsworthy rescue attempts, and a dead whale. Presumably to be sunk at sea by naval gunfire (to quote the late great Spike Milligan). Perhaps they should just have left it alone: people can never resist the urge to fiddle. Sci.env: IPCC understates the risks? There is an interesting exchange today over at sci.env, which touches on some things I've been thinking about recently. See here for the thread & if you want to know who they are (well scroll up a bit); I'll extract some here and then comment. Both sides are people I respect (well they are on my blogroll) and yet they are in violent disagreement. I had the slightly unsettling experience of reading the first post, thinking "yes thats spot on" then reading the reply and thinking "hmmm, some valid points there too". > that the consensus severely understates the risks. reasons to expect the models to be largely correct in broad detail. (according to some rather vague probabilistic statements). The point of all this is, what-do-you-tell-the-public. There's no great problem with what-do-you-tell-fellow-scientists: thats easy: you publish your research and they read it, or not (thats not really true either when I think about it: its true within physical climate; but when you start to try to do impacts on ecology, then the Bio's need the phys stuff interpreted). But the public need it all interpreted: they are not going to read the original papers (even if they have access to them). I have much sympathy for most likely response of the system rather than the risk-weighted outcome (its not technically true: the scenarios are not probability-weighted; but you know how it goes). When I give general-public talks (and you can find the stock one I do, by following a few levels of links from this, if you want to) I downplay the overenthusiasm you find in the media for disaster scenarios, but always with the ever-so-slightly guilty feeling that I may be wrong. I point that out too - I try to mention the uncertainty - but I have the impression that people have problems keeping up with everything and are going to miss the subtle side messages. James "added 1.5 inches to the crotch length" Annan recently blogged about Sexism in Science (and ref'd some interesting CV stuff). So I thought I would offer my (male) perspective. In terms of recruitment, we don't seem to be doing too badly. Quite frequently there are as many women as men around our coffee table at work (because the Real Men are too busy researching to come to coffee... ha ha no; coffee time is close to obligatory unless you're John Turner). We get plenty of female candidates, and in the interviews I've done there has never been a hint of bias against (or for) the women. And I'm one of the people working part-time to help bring up children. OTOH there are no women at all in our senior management structure (or a few, if you lower the seniority bar a bit). Whether this is because its a remnant of previous discrimination, or continuing disc, or innate female unsuitability for senior management I don't know (though I doubt the latter). On the plance back from NZ, I got to watch a weird Japanese TV show called "Masquerade". It was very funny, and I've never seen anything like it before. But then I don't watch much TV. The photo is a screenshot: one chap is a basketball player, and the other chap is the ball (his head; he is dressed in white because you are supposed to not see his body). As a screenshot it doesn't look to impressive: the skill of it is the way the two moved around, with the player bouncing the other chaps head realistically. Another very good one was of a snooker table, where ten people had coloured their heads and then bounced around when struck by the white ball. The contestants make all their props, and jumped around happily when their clapometer scores went up... someone should take it up over here. I didn't have much luck finding it on the web: the closest I found was this pdf (which also features "I’M OLD ENOUGH! ": Very small kids are sent out by their parents to go shopping alone for the first time ever. Is that real? Could you do that over here?). Lovelock: We're all going to die! My Gaia theory sees the Earth behaving as if it were alive, and clearly anything alive can enjoy good health, or suffer disease... The climate centres around the world, which are the equivalent of the pathology lab of a hospital, have reported the Earth's physical condition, and the climate specialists see it as seriously ill, and soon to pass into a morbid fever that may last as long as 100,000 years. I have to tell you, as members of the Earth's family and an intimate part of it, that you and especially civilisation are in grave danger... We are in a fool's climate, accidentally kept cool by smoke, and before this century is over billions of us will die and the few breeding pairs of people that survive will be in the Arctic where the climate remains tolerable. Unfortunately our nation [the UK] is now so urbanised as to be like a large city and we have only a small acreage of agriculture and forestry. We are dependent on the trading world for sustenance; climate change will deny us regular supplies of food and fuel from overseas. We *are* quite urbanised, but the farming area is still much larger than the urban area. Anyway, enough knockabout, what about the substance of Lovelocks words? I disagree with the *certainty* he uses. The temperature rises are not certain; they depend on future CO2 etc emissions (if he is trying to say that these are already committed due to existing forcing, then he is way off the mark; but its all so broad-brush its rather hard to tell). This applies to the "impacts" bit too: i.e. the billions-will-die. He may be right; he may be not. He certainly doesn't back it up with any evidence. Apart from his reputation, why should anyone believe him? Also, his the climate specialists see it as seriously ill, and soon to pass into a morbid fever that may last as long as 100,000 years misrepresents what the "climate specialists" do (if he means the physical climatologists): which is to say, we may well predict (or project) temperature rises, but... tend to leave the impacts alone. And of course the we're-all-going-to-die stuff plays into the hands of the septics: if its going to happen anyway, well then why bother do anything. Lovelock doesn't quite say this, or perhaps he says it then unsays it I cannot see the United States or the emerging economies of China and India cutting back in time... which if read carefully does make it clear that all this *is* contingent on future emissions. ...as the century progresses, the temperature will rise 8 degrees centigrade in temperate regions and 5 degrees in the tropics. and thats about all the substance (apart from noticing the recent global dimming; perhaps he has got carried away with that?) (He also sez We have given Gaia a fever and soon her condition will worsen to a state like a coma. She has been there before and recovered, but it took more than 100,000 years - what is the 100kyr a reference to? One stoat-point to the first convincing answer). Now we all know (having read James "Pielke Demolisher" Annan) that high values of climate sensitivity are unlikely. And the IPCC range is something like 1.5-5 oC (e.g. here). However, what I wanted to hang on this is the fact that temperature increases are expected to vary very strongly by region, and in particular the continents warm rather more than the seas. So its quite possible to get 5-6 oC increases even from the multi-model mean (e.g. this, which is admittedly the TAR but I don't think the numbers are bigger now). But I'm not sure where the 8 oC in the temperature regions and 5 oC in the tropics comes from - perhaps some particular model? is it possible that all this is explained by My new book The Revenge of Gaia expands these thoughts...? I hope not. All in all I'm inclined to file this under "irresponsible journalism". A few snippets from wikipedia... I'm now an admin, and hence have ultimate power to CRUSH ALL MY ENEMIES HA HA HA HA!!! <evil laugh trails off into the distance>. Sadly no: the rules prohibit me from abusing my powers and there are always other people watching anyway. And not that I have too many enemies, Of Course. Some of the comments are interesting though: try the RFA, scroll down for the Opposes. And I've just made my 10,000th edit. That slacker Lubos only has 2.3k, & Charles matthews has a feeble 54k. A boring post pointing out that I've mildly updated my blogroll (its those cryptic letters at the top...). Now the second line is non-climate blogs; or things I don't read so often. Or something. Also (hint to JF...) Deltoid has now moved to Seed/Scienceblogs; as has Chris Mooney; and as will I, at some point, I think/hope. There is an interesting paper out in Nature today (don't send me it, I've just discovered we have Nature online from work, how nice; if you too have access, the article is here and the commentaries here and here: so I've downloaded the pdfs into my computer but not yet into my brain). In the meantime I will of course recomment to you the RealClimate take: Scientists Baffled. I will strongly disrecommend the Grauniad's stupid Global warming: blame the forests; the BBC's Plants revealed as methane source is a bit better. I'm a bit of a fan of Hobbes (I love the language in [[Leviathan]]; its like the King James bible. The book itself is a great read, and a wonderful source of ideas and argument. But... would you want to live in a society where, for example it is annexed to the sovereignty to be judge of what opinions and doctrines are averse, and what conducing to peace; and consequently, on what occasions, how far, and what men are to be trusted withal in speaking to multitudes of people; and who shall examine the doctrines of all books before they be published?). I had (independently of many others, I'm sure) the idea that US (foreign) policy is based on Hobbes-type ideas (this briefly mentions the same; I assume its a commonplace). And now Blur is citing him... or so sez the Grauniad: when I read "PM cites Hobbes and Tawney to justify new police powers" I was agog. Which bit does he quote? there can happen no breach of covenant on the part of the sovereign; and consequently none of his subjects, by any pretence of forfeiture, can be freed from his subjection perhaps? But with characteristic newspaper distain for sourcing, all the paper says is Quoting the 17th-century political thinker Thomas Hobbes and 20th-century social critic RH Tawney, the prime minister hoped the Respect action plan launched yesterday would not be judged on whether or not it was "tough" or populist but as opening a "genuine intellectual debate about the nature of liberty in a modern developed society". Hmmm, I suspect Hobbes would not have been very impressed by a Sovereign with a Respect Action Plan. The Civil Sword was more in his line. So I'm forced off to the #10 website to find the speech. And Prez Blur sez: More grandly, it is the answer to the most fundamental question of all in politics which is: how do we live together? From the theorists of the Roman state to its fullest expression in Hobbes's Leviathan, the central question of political theory was just this: how do we ensure order? And what are the respective roles of individuals, communities and the state? And thats the only use of Hobbes I can find. So: Blur is *not* quoting Hobbes, only citing him: or rather, invoking H's mighty name in an effort to lend weight to B's pallid policies. And does he seriously believe that politicial theory attained its fullest expression in Hobbes's Leviathan? Its bizarre. Yes I love the book and the language but you can't use it as a textbook for running a state (I'm sure Blur would love to, but even our supine parliament wouldn't let him go that far). Not, not the content, the format. IJ points out that viewed with Internet Exploiter the sidebar on the right drops down to the bottom. Indeed it does, though if you look closely you'll see it puts it in the correct place to start with, then reformats the sidebar to the bottom later. Odd. Having just said that not much is happening in the climate world, there was an interesting paper in Nature just before Christmas in Nature: Bellouin et al., about possible underestimates of the aerosol effect. Oddly enough I haven't heard much about this... maybe its because it was just before Crimbo (someone has just posted it to sci.env though). Or maybe its because no-one wants to talk about it: from the Grauniad: "We found that aerosols actually have twice the cooling effect we thought," said Nicolas Bellouin, a climate modeller at the Met Office. The consequence is that as air quality improves and aerosol levels drop, future warming may be greater than we currently think.". Thats not really anything the skeptics are going to want to tell you. And if you're a... opposite-of-skeptic I suppose, then the idea that the GCMs have got the aerosol forcing wrong is nothing to trumpet either. I did read the Nature article and I remember thinking it seemed Fair Enough (though I can't re-read it because the evil information-hoarding folk at Nature won't share it... I can't even find a free abstract); you can read the UKMO press release. There was some kind of let-out clause (that maybe, to compensate, the *indirect* effect could be weaker). so its possible that another answer is as she says: the new numbers may be different to previous UKMO ones but are within the uncertainty range. [Update: the pdf fairy has been to visit, so I've read it again (or rather, for the first time: I now realise I only read the commentary; reading the paper I don't see the bit about indirect effect, so maybe that was invented by the commentary...). They estimate a (clear sky) RF of -1.9 W/m2 whereas the TAR (graph estimates about -0.4, with a range up to nearly -1.0. Though the TAR value isn't clear-sky... but B et al. say the model value is -0.5 - -0.9, which is similar. validated against observations, these estimates remain uncertain. Since the wiki climate pages have been pretty sane recently, and not a lot has been happening on the climate front, I've been browsing further afield and contributed to the [[Cold Fusion]] page. Or rather, to the discussion of it. Its interesting in itself, if you're interested (so to speak) but its also interesting as an illustration of the problems of psuedo/fringe science: that the True Believers in such are generally far more commited, and often more knowledgeable (in some sense; they know more things about it but not the one key thing: that its wrong...) that the larger mass of folk. So if anyone out there has a reasonable knowledge of nuke-related matters (hello, John!) do go and have a look and leave a comment at least. And while I'm on this stuff, I really ought to mention the RFA against Reddi. The nuclear process emits 2-6 grams of carbon equivalent per kilowatt-hour, while coal, oil and natural gas emit 100-360 grams of carbon per kilowatt-hour . (actually thats The Age's paraphrase; hopefully they can report figures accurately). A complete life-cycle analysis shows that generating electricity from nuclear power emits 20-40% of the carbon dioxide per kiloWatt hour (kWh) of a gas-fired system when the whole system is taken into account. Hmm... how do we reconcile these two estimates? Firstly gas is better than oil or coal so perhaps we can take the "100" from the first; but even then taking the "6" from the first and the lowest, 20%, from the second we have 6% compared to 20%, a factor of 3 disparity. Unfortunately the source for the second lot (http://www.oprit.rug.nl/deenen/) is currently offline. Based on a simple argument (I think most of the monetary costs of nukes is engineering and safety and disposal; if the CO2 costs were really 40% nukes would probably be even more uneconomic than they are) I'm disinclined to believe the second set. That doesn't mean I do believe the first, though. I do agree with SB on the comments to my first post: that there are vast energy efficiency gains possible. BS's argument that nukes are too safe is worth reading too. But having said that, any other refs to nukes CO2 would be welcome. Oh... and this *isn't* going to become an energy-sources blog... back to the science soon! Gas delivery is in the news here, not a usual topic even in winter. But the shut-off by Russia of the Ukraines gas supply is having interesting consequences. So far they are only interesting, hopefully they won't get worrying. Refs for this: Guardian and again and more; and the BBC. The story so far... the EU imports 40% of its gas; the UK, 10%, since the North Sea is starting to run out. Russia exports a lot, but recently decided that the Ukraine ought to pay full market price instead of being subsidised (which is sort-of a pay-off for them cosying up to Nato and the EU and stuff; though exactly why the Ukraine should be subsidised I'm not sure; anyway, thats all the politics bit). Ukraine refused, Russia turned off the taps (in some sense). The complicating bit is that a lot of EU gas goes via Ukraines pipelines; the Russians (in absolutely direct terms) have accused the Ukrainians of diverting some of this and stealing it. Meanwhile the Ukraine accused Russia of resorting to "blackmail" in order to undermine Ukraine's economy. Now France, Italy, Germany and Poland have reported shortages because of Russias actions and are understandably p*ss*d off; its not clear whether the Russian text is designed to divert blame. The EU have called on Russia and the Ukraine to resume discussions; the US seems to be leaning on Russia a bit. None of this has much to do with climate or science, of course. But it does give some taste of the unpleasantness that might happen when gas supplies really start to run out. It may also affect the should-we-build-more-nukes debate. No-one wants to be left cold in the winter.